At Last - Open for Business! The shop has been undergoing renovation from just before Christmas break 2008 till January 2010. It was a tough year working out of a portable classroom with very few tools and no hoist. The entire months of January and February the students have been hustling to clean, sort, install and organize tools and equipment. We have been fortunate to have "Mrs. C" to direct this enormous undertaking. Each week we can see huge progress over the previous week. Check out our new Build Room. This area was our old, cramped classroom. Now it will be used to assemble project cars and do sheet metal fabrication. We have some nice storage cabinets, a sealed floor, plenty of light and room to work. The turquoise machinery next to the wall is a brand new Lazze English Wheel and a Lazze Power Bead Rolling tool. 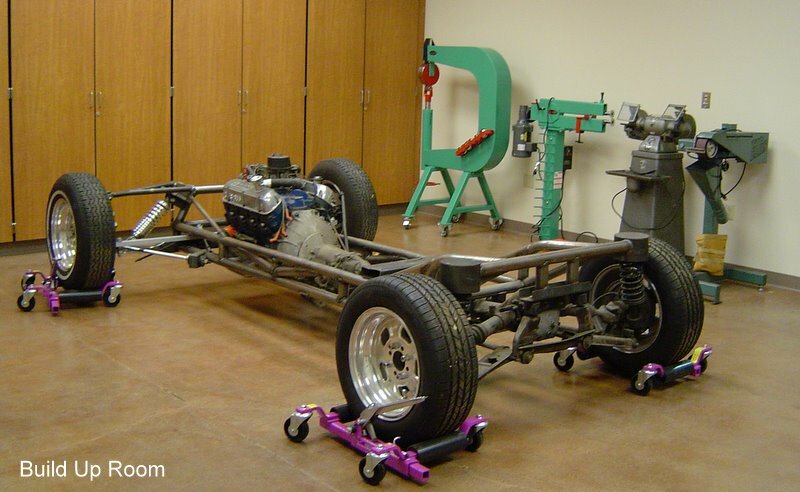 The chassis on the jack style rollers is our current project, the Surf Woody, now complete with engine and transmission. Finally...A new classroom. Large enough to hold 35+ students, their desks and backpacks. We can even walk down the aisles between the desks without tripping. All we need now is to get the television hooked up properly. 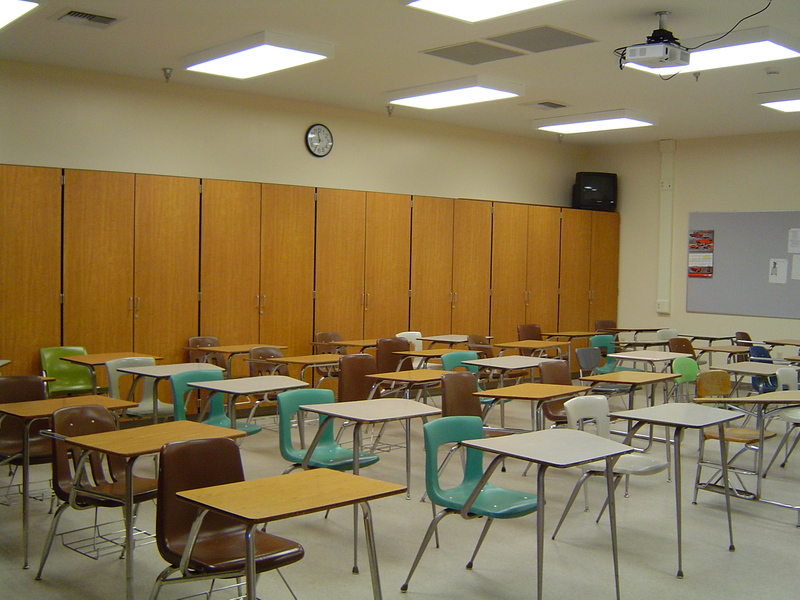 Seems like the building designer never talked to a teacher about classroom configuration. I give them an F for design. The heater? Don't get me started. 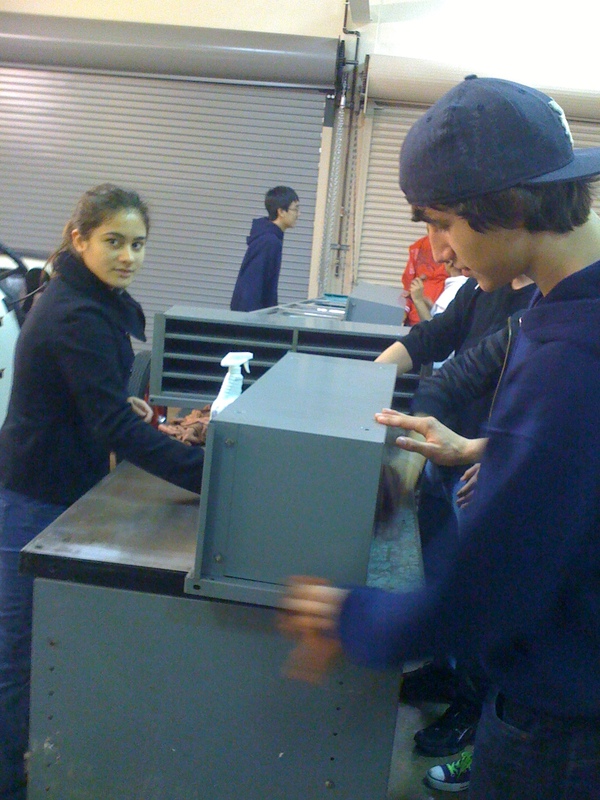 Auto 1 students Aja Hartman and Tomas Diaz-Wahl clean one of the shelf sets for the nuts and bolt cabinet that will go in the tool room.